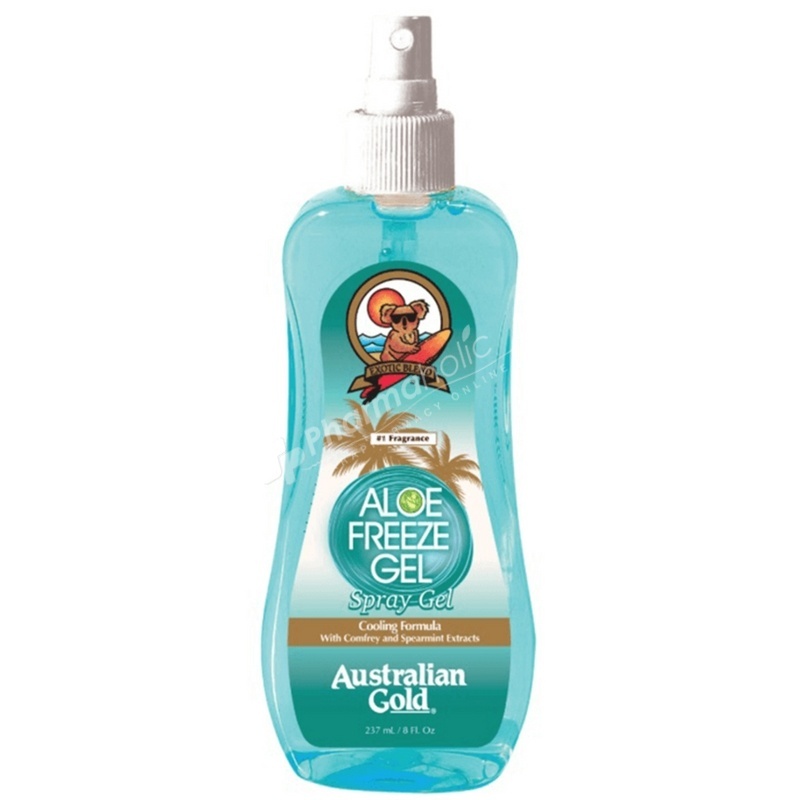 Australian Gold Aloe Freeze Gel Spray soothes and cools skin that has been exposed to wind or sun. It contains extracts and skin conditioning agents to soften and revitalize skin. It may be used as a daily moisturizer. Aloe Freeze Spray Gel soothes and cools skin that has been exposed to wind or sun. It contains extracts and skin conditioning agents to soften and revitalize skin. It may be used as a daily moisturizer. Water, Propylene Glycol, Polysorbate 20, Aloe Vera Leaf Juice, Vitamin E Acetate, Spearmint Leaf Oil, Lemon Bioflavonoids, Pollen Extract, Comfrey, Linden Extract, Phenoxyethanol, Panthenol, Methylparaben, Carbomer, Triethanolamine, Glyceryl Polymethacrylate, PEG-60 Lanolin, Disodium EDTA, Propylparaben, Allantoin, Blue 1. For external use only. Avoid contact with eyes. Discontinue if skin irritation occurs. This product does not contain sunscreen and will not protect you from sunburn.